The faculty of Bucknell University grant to Bucknell University limited use of their scholarly articles for the purpose of making these articles open access. Specifically, each faculty member grants Bucknell University a non-exclusive, paid-up, worldwide license for each of his or her scholarly articles for the purpose of making these articles openly accessible in an institutional repository, and grants Bucknell University permission to exercise all rights under copyright for this purpose, as well as to authorize other parties to do the same, provided that the articles are not sold for income or profit. A scholarly article is defined as a peer-reviewed scholarly work published in a journal or in another format that a faculty member determines to be appropriate for his or her particular discipline. The policy applies to all scholarly articles authored or co-authored while the author is a faculty member of Bucknell University except for any articles completed before the adoption of this policy and any articles for which the faculty member entered into an incompatible licensing or assignment agreement before the adoption of this policy. The license granted to Bucknell University by this policy will in no way interfere with the rights of a faculty member as the author of the work. Furthermore, the license granted to Bucknell University for an article will be automatically waived for any reason and without sanction at the sole discretion of the faculty member upon written/electronic notification to Bucknell University's scholarly communications officer. To assist in the open distribution of the scholarly articles, faculty members are requested to provide bibliographic information and an electronic copy of each article to the scholarly communications officer, who will be designated by the Vice President for Library and Information Technology. In order to ensure that articles are available in a timely manner, it is recommended that faculty members provide articles within 30 days after the date of publication. The Dean's offices of the College of Arts and Sciences and the College of Engineering and the Committee for Library and Information Resources will be responsible for interpreting this policy, resolving disputes concerning its application, and recommending changes as necessary. While this policy does not apply to other types of faculty publications other than peer-reviewed articles (e.g. monographs, book contributions, conference papers, etc. 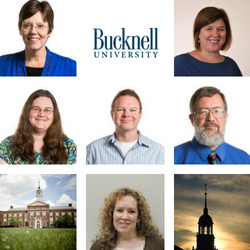 ), faculty members are encouraged to provide the bibliographic information for these publications to the scholarly communications officer for inclusion in the Bucknell University institutional repository. << Previous: Why Open Access?